I have thrilling news to share on the creative writing front! Some of you might remember that I've been attending Breathe Writers' Conference here in Grand Rapids for the past five years (this year will be my sixth!). One of my favorite workshop leaders at the conference, Amy Nemecek, who is an extraordinary poet and book editor, decided she wanted to do more for the attendees than provide breakout sessions; she wanted to offer them a venue in which to submit work. 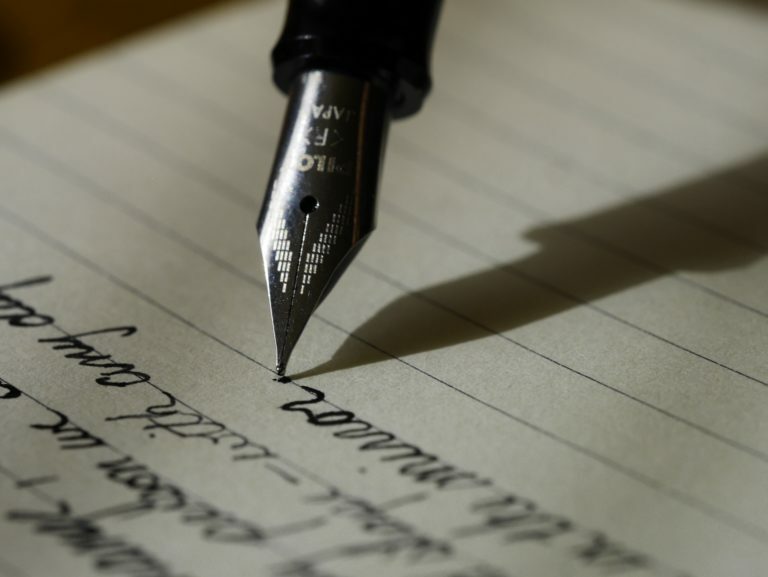 Back in October, as the conference was drawing to a close, she announced she would be starting Exhale: A Journal of the Breathe Writers Conference — a literary publication for Breathe attendees past and present featuring fiction, creative nonfiction, and poetry. I submitted three poems in January and found out last night that two of them, "The Fallow Field" and "Hymn for Hesitation," were accepted for publication in the inaugural issue. I am beyond excited to hold the journal in my hand this fall and read the beautiful words written by women and men from all walks of life who I've come to know over the past half-decade. Stay tuned for the big reveal this October! “A Prayer for Owen Meany,” by John Irving, (William Morrow, 1989) packs a punch. Friendship, love and ironclad faith characterize one of the most unusual fictional characters I’ve had the pleasure of meeting. Owen Meany is small for his 11 years, with a voice “not entirely of this world,” “a strangled, emphatic falsetto,” that sounds like a scream and is always written in capital letters. His big opinions and commanding personality more than make up for his missing inches. The book is narrated by his best friend, Johnny Wheelwright. When they are boys in 1953 (not a spoiler, it’s on the back cover), Owen hits a foul ball at a Little League game that kills Johnny’s mother. 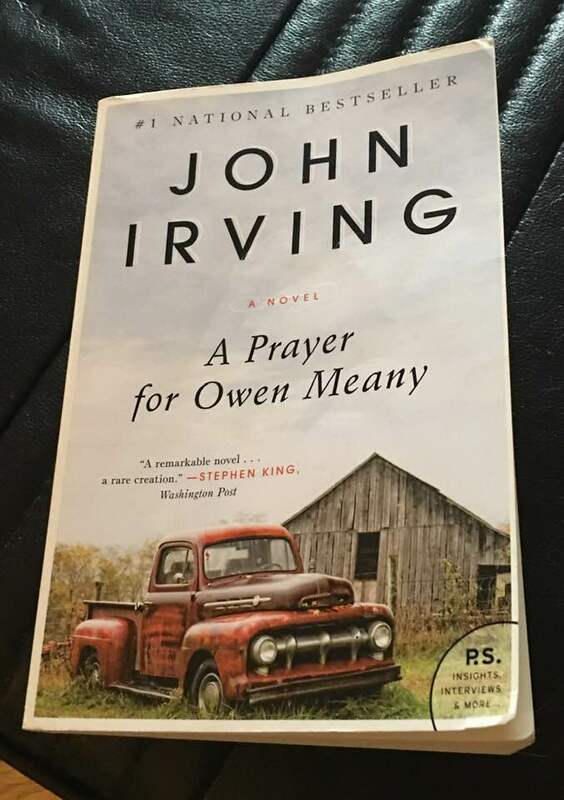 The rest of the book is divided between snippets from adult John’s life and flashbacks to the years following “the incident,” as Johnny and Owen’s bond remains undiminished even as family dynamics change and the Vietnam War encroaches. Unbeknownst to his best friend, Owen is preparing for his destiny, a fate he sees spelled out in the unlikeliest of places. Through a story that is soaked in the mystery of the divine, Irving shows how doubt is the essence of faith, not its enemy — and the most painful parts of life can lead us to the ultimate truth. 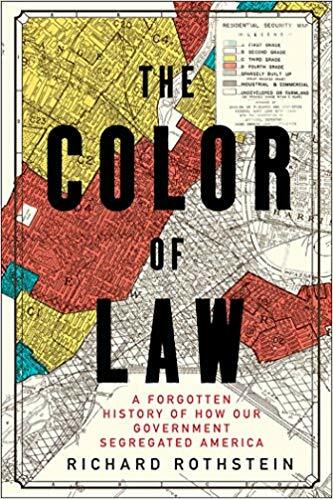 “The Color of Law,” by Richard Rothstein, makes it very clear that segregation in all parts of the country is not and never has been de facto. White privilege persists because of more than a century of unconstitutional “de jure segregation,” or “segregation by law” following the Reconstruction period. A collusion of federal, state and local actions made it so. The book shows all the ways white privilege was created, enhanced and/or guaranteed through federal housing policies, while simultaneously policies of exclusion were being created, enforced and reinforced by the same government that bent over backward to make favorable provisions for whites. And we aren’t just talking pre-civil rights era. We are talking about policies of exclusion and predatory lending practices that continue into the 21st century and led to the 2007-08 housing collapse. When the dust settled, African Americans were found to be three or four times more likely to have been sold homes with subprime, adjustable-rate mortgages, which led to sky-high interest rates and ultimately foreclosure. Families who defaulted were barred from qualifying for future conventional (federally guaranteed) mortgages. This set African American homeownership rates back at least a couple of decades when they were already woefully behind. There are so many specific examples in the book of federal, state, and local government programs—statutes, zoning ordinances, clauses, “restrictive covenants,” regulatory actions, cooperation with the private and nonprofit sectors and even churches—to sponsor and maintain residential segregation, all of it unconstitutional according to the Thirteenth, Fourteenth and Fifteenth Amendments of the Reconstruction period. I cannot even number the examples. Even Eleanor Roosevelt, lauded by many as a champion of civil rights up to 30 years before her husband took office, had no idea of the extent of de jure segregation until touring the country and learning about how segregation impacted job opportunities, incomes, education and whole neighborhoods. She invited Walter White, then executive secretary of the NAACP, and several presidents of historically black colleges and universities, to the White House to discuss the situation. The conversation lasted until midnight, and I’m sure they could have kept going. She was shocked. But her husband’s New Deal stimulus program went on to form agencies that both reinforced and created segregation from the ground up. 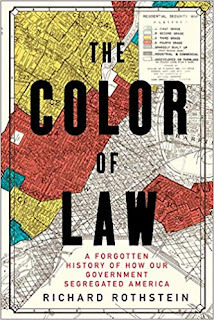 Regarding the impact of segregation on intergenerational wealth, “The Color of Law” shows it’s in large part due to the VA and Federal Housing Administration’s exclusionary insuring and subsidizing practices for single-family home mortgages—one facet of redlining—that African Americans missed out on the home-buying heyday of the 1950s and ‘60s. Denied the opportunity to build equity for three generations like white working class Americans did, African Americans’ median household wealth today ($11,000 per capita, assets minus liabilities) is less than 10 percent of the median household wealth of white families ($134,000, assets minus liabilities). I never learned most of this in school. I’m just scratching the surface of all the author says. “The Color of Law” should be required reading. If not in high school, please God, in college. And we should throw away the other textbooks that perpetuate a false mythology of de facto segregation. And, might I add, this is why it’s so important to vote in every single f***ing election. We need elected officials at all levels of government who can commit to fully replacing systems built for the purpose of exclusion, the effects of which persist today. In the final chapter of this book, Rothstein proposes a series of actions we could take as a nation to own our complicity in segregation and reverse course. It would take cooperation at all levels. Stopping future discrimination does nothing to fix what will stay broken if we learn nothing and do nothing. Justice delayed is justice denied... always.